In rheumatic and other chronic inflammatory diseases, high amounts of energy for the activated immune system have to be provided and allocated by energy metabolism. In recent time many new insights have been gained into the control of the immune response through metabolic signals. Activation of immune cells as well as reduced nutrient supply and hypoxia in inflamed tissues cause stimulation of glycolysis and other cellular metabolic pathways. However, persistent cellular metabolic signals can promote ongoing chronic inflammation and loss of immune tolerance. On the organism level, the neuroendocrine immune response of the hypothalamic-pituitary adrenal axis and sympathetic nervous system, which is meant to overcome a transient inflammatory episode, can lead to metabolic disease sequelae if chronically activated. We conclude that, on cellular and organism levels, a prolonged energy appeal reaction is an important factor of chronic inflammatory disease etiology. Energy metabolism is an important part of the background machinery that ensures proper function of immune cells and the immune system . In rheumatic disease and other chronic inflammatory diseases (CIDs), the activation of the immune system consumes vast amounts of energy (that is, up to 2,000 kJ/day and more) . In recent years many new insights have been gained into multilevel interactions between metabolic and immune systems [3–7]. An increasing body of evidence suggests that energy metabolism is crucial for the maintenance of chronic inflammation, not only in terms of energy supply but also in the control of the immune response through metabolic signals [8–11]. The interplay between immunology and metabolism thus plays a central role in the pathophysiology of CIDs and bears great therapeutic potential. In this review we provide an update on recent findings in the field of energy metabolism in chronic inflammation and CIDs, firstly focusing on the cellular level and secondly considering the energy metabolism of the organism and consequences for CIDs. The main donor of free energy in cells is ATP , which is generated both by glycolysis and by oxidative phosphorylation (OXPHOS) [12–14]. Most cells break down glucose to pyruvate via cytosolic glycolysis, and then oxidize pyruvate to carbon dioxide in the mitochondrial tricarboxylic acid cycle, generating most of the ATP through OXPHOS at the electron transport chain [12–14]. Nutrients such as fatty acids and amino acids can also be degraded to pyruvate, acetyl-coenzyme A, or other intermediates of the tricarboxylic acid cycle to maintain ATP production . In contrast, in many cancer cells and activated T cells, pyruvate is preferentially converted into lactate that is secreted from the cells, rather than pyruvate being oxidized in the mitochondria [12–14]. By this process - known as aerobic glycolysis (also called the Warburg effect) - only two ATP molecules per molecule of glucose are yielded, compared with a maximum of 36 ATP molecules when glycolysis is coupled to OXPHOS [4, 12, 14]. Although it seems counterintuitive for cells to use a low-efficiency pathway to produce ATP under conditions of high energy demand, it has been proposed that aerobic glycolysis produces the requisite reducing equivalents and biosynthetic substrates that are required for proliferation [12, 14]. The serine/threonine kinases AKT1 to AKT3, AMP activated protein kinase (AMPK), mammalian target of rapamycin (mTOR), and LKB1 (also known as STK11) are regarded as cellular nutrient sensors that help to maintain energy homeostasis by relaying signals that determine how cells respond to high or low levels of intracellular carbohydrates or amino acids . Activated AKT, also known as protein kinase B, is induced by phosphoinositide 3-kinase (PI3K) and represents the primary downstream mediator of the metabolic effects of insulin . In T cells, AKT is activated by T-cell receptor/CD28 co-stimulation and growth factors/cytokines such as IL-2 or IL-7 [16, 17] (Figure 1). AKT increases glucose uptake by stimulating the localization of glucose transporters to the plasma membrane, and it can increase glycolysis by promoting the activities of the rate-limiting glycolytic enzymes hexokinase and phosphofructokinase . AKT activates mTOR, a key regulator of translation and major effector of cell growth and proliferation, which increases the expression of amino acid transporters [19, 20]. mTOR forms two distinct complexes, mTORC1 and mTORC2, respectively. mTORC1 stimulates diverse metabolic pathways, including glycolysis, the oxidative arm of the pentose phosphate pathway, and de novo lipid biosynthesis . Metabolic pathways in T cells. T-cell activation by T-cell receptor (TCR)/CD28 co-stimulation and growth factors/cytokines such as IL-2 or IL-7 activate AKT through phosphoinositide 3-kinase (PI3K) induction in a similar manner to insulin, inducing increase of glucose uptake and glycolysis. The switch to glycolysis allows production of the requisite ATP and biosynthetic substrates that are required for proliferation, cytokine synthesis and other T-cell functions. AKT activates mammalian target of rapamycin (mTOR), which increases the expression of amino acid transporters and glycolysis. Inflammation can also lead to hypoxia and reduced nutrient supply. Low ATP levels activate AMP activated protein kinase (AMPK), which upregulates catabolic processes, such as fatty acid oxidation, and downregulates anabolic metabolism. AMPK can inhibit mTOR via raptor and lead to cell-cycle arrest. Hypoxia induces hypoxia inducible factor (HIF) expression via mTOR activity. HIF-1 forms tertiary complexes with RORγt and p300, and enhances inflammation-promoting Th17 cell development through recruitment to the IL-17 promoter or upregulation of glycolysis. Concurrently, HIF-1 attenuates inflammation-restricting regulatory T cell (Treg) development by binding Foxp3. HIF-1 induces migration inhibitory factor (MIF), which in turn causes HIF-1 expression via the MIF receptor (MIF-R) in a positive feedback loop. The AMPK stimulator metformin and the mTOR inhibitor rapaymcin are able to augment fatty acid oxidation and can increase Treg generation. Mammalian AMPK, another evolutionarily conserved protein kinase, which is a metabolic master switch and fuel gauge, is activated under conditions that increase the AMP⁄ATP ratio, including glucose deprivation and hypoxia . Once activated, these kinases mediate the upregulation of energy-producing catabolic processes, such as fatty acid oxidation and glycolysis, and down-regulate energy-consuming anabolic metabolism [22, 23]. The phosphorylation of the mTORC1 component raptor by AMPK is required for the inhibition of mTORC1 and cell-cycle arrest induced by energy stress . There is complex crosstalk between the highly conserved nutrient sensors and the molecular clock of peripheral cells coordinating the circadian control of energy supply on a cellular level [25, 26]. Immune cells require energy for housekeeping functions as well as for specific immune functions (Table 1). The main housekeeping functions that use significant amounts of ATP are processes of ion transport and macromolecule synthesis. Specific immune functions include motor functions, antigen processing and presentation, activation and effector functions such as synthesis of antibodies, cytotoxicity, and regulatory functions  (Table 1). Calculations show that a quiescent leukocyte needs 1.1×10-11 mol ATP/day for protein production and 5.5 × 10-11 mol ATP/day in total . Activation of quiescent leukocytes leads to an increase of energy expenditure by a factor of 1.3 to 1.5 , so an activated leukocyte needs 7.2 × 10-11 to 8.3 × 10-11 mol ATP/day. The cellular energy metabolism is relevant to be considered in terms of diseases, for example in cells within the inflamed rheumatoid arthritic joint, because energy supply is limited [27, 28]. Firstly, due to the invasion of immune cells and tissue swelling, the relative oxygen/cell ratio is decreased. Secondly, cell accumulation and inflammatory edema increase the distance between cells and oxygen-supplying arterial vessels. Thirdly, vasodilatation, as induced by inflammatory mediators such as prostaglandin E2, lowers blood flow and thus the supply of oxygen and nutrients is reduced (such as glucose and amino acids) as well as the removal of metabolic waste (such as lactate and carbon dioxide) [27, 28]. A recent investigation of the energy-adaptive potential of human stimulated CD4+ T-helper cells under conditions of impaired OXPHOS and/or low glucose (which inhibits glycolysis) demonstrated that OXPHOS and glycolysis are completely interchangeable in terms of ATP production . Furthermore, specific T-cell functions such as cytokine production and proliferation are unaffected in glucose-containing medium, even under complete OXPHOS suppression. Only when glucose is also absent are these functions significantly decreased . Human CD4+ T cells thus own a high adaptive potential to maintain specific functions even under severely impaired bioenergetic conditions. However, proliferation and cytokine production of human CD4+ T cells are - despite a high adaptive potential - dependent on a certain supply with energy, and glucose is obviously of crucial importance for proliferation not only from the bioenergetic point of view as a substrate for ATP synthesis, but also in terms of being either directly and/or indirectly and essentially involved (for example, as a precursor molecule for macromolecule synthesis) in key steps of cellular proliferation and cytokine synthesis [27, 29]. Another study on stimulated human CD4+ T cells examined the effect of limited oxygen availability and/or lack of glucose, and found both that cumulative hypoxia stimulates the secretion of proinflammatory and proangiogenic cytokines in the presence of glucose and that the lack of glucose resulted in lower cytokine concentrations . These observations support the view of hypoxia being a key driving factor in chronic inflammation. The first data indicating the hypoxic nature of the rheumatoid arthritis (RA) synovium were achieved in the 1970s by measuring oxygen tension by means of a Clark-type electrode in samples of synovial fluids of patients with RA [28, 30, 31]. Hypoxia has been demonstrated in patients with RA undergoing surgery for tendon rupture by Sivakumar and colleagues . Just recently, by means of a novel oxygen-sensing probe in vivo, even a direct relationship between tissue partial pressure of oxygen levels and joint inflammation (specifically T-cell and macrophage infiltrates and proinflammatory cytokine expression) could be demonstrated for the first time , and it was shown that hypoxia can be reversed by antiinflammatory treatment . One principal regulator of the adaptive response to hypoxia is the transcription factor hypoxia inducible factor (HIF)-1 [28, 35]. HIF-1 is a heterodimeric protein that consists of an oxygen-sensitive α subunit and a constitutively expressed β subunit [28, 36]. In nonhypoxic cells, HIF-1α is continuously tagged by oxygen-dependent hydroxylation and in this way targeted for proteasomal degradation [28, 36]. Under hypoxic conditions, however, HIF-1 is stabilized. HIF-1α protein synthesis is upregulated mainly via the PI3K/mTOR pathway . HIF target genes promote erythropoiesis, angiogenesis and vasodilatation, and HIF is a master switch to a glycolytic cell metabolism, resolving and counteracting hypoxic conditions . Several findings indicate that HIF is involved in the persistence of inflammation and progression of neovascularization during RA. HIF is abundantly expressed in the arthritic tissue . Deletion of HIF in macrophages and neutrophils resulted in a complete loss of the inflammatory response . Hypoxia might also play a central role in pathogenesis of systemic sclerosis by augmenting vascular disease and tissue fibrosis [40, 41]. However, HIF-1 was found to be decreased in the epidermis of systemic sclerosis patients compared with healthy controls , perhaps due to an increased prolyl-hydroxylase activity resulting in faster degradation of HIF-1 . A recent article suggests a positive-feedback loop of HIF-1α and the proinflammatory cytokine macrophage migration inhibitory factor (MIF) in human CD4+ T cells . Hypoxia, and specifically HIF-1, is a potent and rapid inducer of MIF. In turn, MIF signaling via the MIF receptor CD74 is essential for hypoxia-mediated HIF-1α expression and HIF-1 target gene induction involving ERK/mTOR activity complemented by PI3K activation upon mitogen stimulation . MIF is also able to counter-regulate glucocorticoid-mediated suppression of MIF and HIF-1α expression . Targeting MIF and HIF may thus be effective in disrupting self-maintaining inflammation. The differentiation of naïve CD4 cells into Th1 and Th17 subsets of T-helper cells is selectively regulated by signaling from mTORC1 that is dependent on the small GTPase Rheb . Interestingly, CD4+ T-cell subsets require distinct metabolic programs . Th1, Th2 and Th17 cells express high surface levels of the glucose transporter- Glut1 and switch on a highly glycolytic program. In contrast, regulatory T cells (Tregs) express low levels of Glut1 and have high lipid oxidation rates . In an asthma model, AMPK stimulation was sufficient to decrease Glut1 and increase Treg generation, indicating that the distinct metabolic programs can be modulated in vivo . Recently, persistent hypoxia and glycolysis were demonstrated to control the balance between inflammation-promoting Th17 cells and inflammation-restricting Tregs [9, 45]. Hypoxia-induced HIF expression exerts a direct transcriptional activation of RORγt, a master regulator of Th17 cell differentiation, and recruitment to the IL-17 promoter via tertiary complex formation with RORγt and p300 (Figure 1) [9, 45]. Concurrently, HIF-1 attenuates induced Treg development by binding Foxp3, a key transcription factor that promotes the Treg lineage, via a proposed ubiquitination pathway [9, 45]. Mice with HIF-1α-deficient T cells are resistant to induction of Th17-dependent experimental autoimmune encephalitis, associated with diminished Th17 cells and increased Tregs, indicating the therapeutic potential of HIF modulation. Similar to these findings, another study suggested that HIF-1α is involved in differentiation of Th17 cells and Tregs, but ascribed the role of HIF-1a to upregulation of glycolysis and not as a direct effect of HIF-1a on RORγt and Foxp3 [9, 46]. Supporting the concept that hypoxia and IL-17A are key mediators in inflammatory arthritis, patients with lower tissue partial pressure of oxygen <20 mmHg have been demonstrated to have increased IL-17A positive mononuclear cells . Tumor hypoxia appears to be different, as it has been reported to inhibit T-cell proliferation and cytokine secretion and to activate Tregs . Glycolysis has been suggested to play a role in the pathogenesis of RA . The activity levels of two major enzymes of the glycolytic pathway - glyceraldehyde 3-phosphate dehydrogenase and lactate dehydrogenase - were increased in RA synovial cells . However, clear studies of a direct relationship of increased glycolytic activity and inflammation are lacking. It is striking that several glycolytic enzymes such as glucose-6-phosphate isomerase, enolase, aldolase and triose phosphate isomerase act as autoantigens ; however, their role in RA remains unclear [49, 51, 52]. Rapamycin (also known as sirolimus) is an mTOR inhibitor used in transplantation medicine. This inhibitor acts similar to the immunosuppressant FK506 (tacrolimus) by binding to the intracellular immunophilin FK-binding protein 12 (FKBP12). Unlike the FK506-FKBP12 complex that inhibits calcineurin, however, the rapamycin-FKBP12 complex interferes with the function of mTOR. Rapamycin has been found effective for systemic lupus erythematosus and systemic sclerosis in animal models and pilot clinical trials [53–57]. Tregs can be expanded by rapamycin in vitro  and were found to suppress colitis in an experimental mouse model . In addition to their more established roles in nutrient responses, AKT1 to AKT3, AMPK, and LKB1 are suggested to also control the fate switch from cytotoxic effector to memory CD8+ T cells [3, 5]. 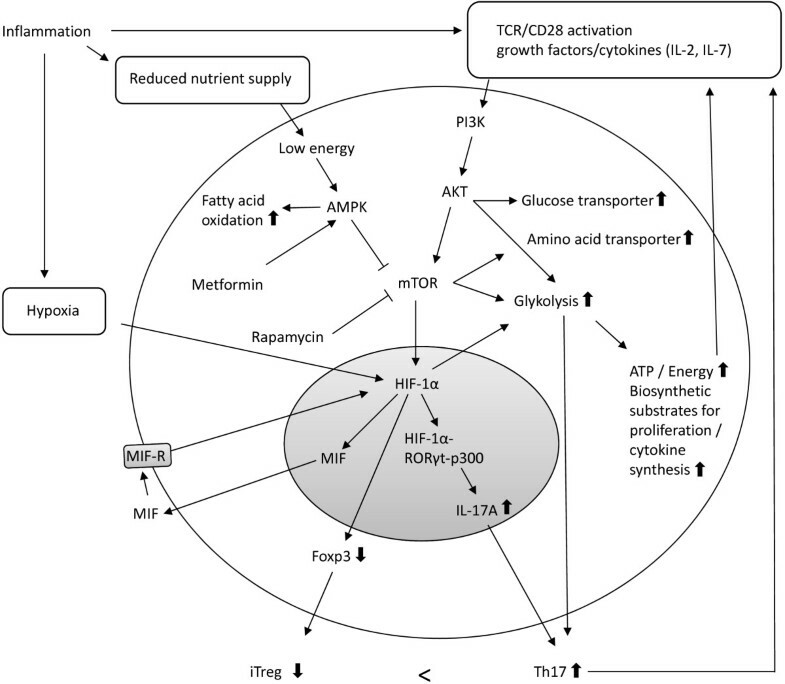 It was proposed that, following the peak of the primary T-cell response to infection, T cells experience metabolic stress - perhaps due to nutrient and/or growth factor limitation as infection is cleared and antigen concentrations decline - and cells need to switch from glycolysis to other forms of catabolism, such as fatty acid oxidation, in order to survive and develop into memory T cells [6, 60, 61]. Treatment of mice after infection with either the mTOR inhibitor rapaymcin or the AMPK stimulator metformin, two drugs that augment fatty acid oxidation, enhanced the development of memory CD8 T cells [6, 60, 61]. Similar to T cells, dendritic cells were recently shown upon activation by Toll-like receptors to switch from oxidative phosphorylation to glycolysis . This metabolic switch depends on the PI3K/AKT pathway, is antagonized by AMPK, and is required for dendritic cell maturation . The molecular basis of increased glycolysis in response to Toll-like receptor activation is poorly understood but might be linked to expression of 6-phosphofructo-2-kinase/fructose-2,6-biphosphatase or HIF-1α [7, 63, 64]. Activation of macrophages by IFNγ and lipopolysaccharide inhibits mitochondrial respiration by release of large quantities of nitric oxide produced by the inducible nitric oxide synthase . In monocytes/macrophages, hypoxia can prolong the survival of these cells - most probably by enhancing glycolysis . Furthermore, monocytes begin to acquire a glycolytic metabolism during differentiation into macrophages, with possible significance for the ability of tissue macrophages to adapt to hypoxia . Prolongation of survival by hypoxia has also been found for human neutrophils [67, 68]. NOD-like receptors are involved in the recognition of host-derived and microbial danger-associated molecules that lead to the assembly of high-molecular-mass complexes called inflammasomes and the subsequent generation- of active caspase 1, a requisite for the production of the inflammatory cytokine IL-1β . Recently, the NLRP3 inflammasome has been shown to cause insulin resistance in the periphery and may be important for the pathogenesis of type 2 diabetes [7, 69]. It is under discussion whether the NLRP3/IL- 1 system might cause insulin resistance in order to prevent generation of damaging- metabolites of glucose metabolism, or to spare glucose for leukocyte function in immune cells , suggesting metabolic sequelae of an energy appeal reaction also on the cellular level (see below). In contrast to metabolic changes, which occur locally in cells and tissue - for example, due to hypoxia at the site of inflammation - interesting metabolic changes can also occur systemically. Circulating peripheral blood cells, such as T cells, display oxidative stress due to depletion of glutathione in systemic lupus erythematosus . Levels of surface thiols and intracellular glutathione of leukocytes are significantly lower in RA patients . Excessive production of reactive oxygen species disturbs the redox status and can modulate the expression of inflammatory chemokines, leading to inflammatory processes . Such differences in metabolism may represent a clear distinction between localized and systemic autoimmune inflammatory diseases. Energy metabolism is not only a question for a single cell or a group of cells such as, for example, T cells or muscle cells, because provision and allocation of energy-rich fuels involves the entire body. Need for energy-rich substrates at a certain location in the body can induce a systemic response if local stores are not sufficient to provide necessary supplies. The systemic response redirects energy-rich fuels from stores to the site of action, the consumers . Such a redirection program can be started by a voluntary act when an individual decides to use muscles during exercise. In such a situation, the central nervous system activates, among others, the sympathetic nervous system (adrenaline, noradrenaline), the hypothalamic-pituitary-adrenal axis (cortisol), and the hypothalamic-pituitary-somatic axis (growth hormone, insulin-like growth factor-1), which induce gluconeogenesis,- glycogenolysis, and lipolysis. This is supported by release of IL-6 from muscles into systemic circulation, which helps activate the redirection program . Redirection of energy-rich substrates from storage sites to consumer can be called the energy appeal reaction. If the immune system needs energy-rich fuels in the context of infection or other forms of activation, a similar energy appeal reaction is prompted . The response is a concerted action of the neuroendocrine immune network. But does the activated immune system need a lot of energy? Table 2 presents the energy demand of the entire body, systems, and organs. Obviously, the immune system needs a lot of energy, particularly in an activated state. In an inflammatory situation, the energy appeal reaction is driven by cytokine-induced stimulation of the central nervous system, endocrine organs, and energy storage organs such as the liver, muscles, and fat tissue . IL-6 is a classical candidate that can activate these remote places (but also IFNγ, IFNα, IL-2, TNF, and others ). Data taken from . a10,000 kJ = 2,388 kcal. bSee derivation of energy need in . cEnergy need is difficult to estimate independent of the immune system in these organs. The question remains whether this seemingly adaptive program has been positively selected in the context of CIDs such as RA or systemic lupus erythematosus. The evolutionary principle of replication with variation and selection is undeniably fundamental and has history. This is a successful history of positive selection, which can only happen under circumstances of unrestricted gene transfer to offspring. The hypothesis is that genes which play a specific role in CIDs were not positively and specifically selected for a CID because unrestricted gene transfer was not possible in CIDs [2, 74]. If this is correct, regulatory mechanisms of the neuroendocrine immune network did not evolve to cope with CIDs. Instead, the neuroendocrine immune network was positively selected in the context of nonlife-threatening transient inflammatory episodes such as, for example, infection or wound healing. These episodes are usually short lived and do not last longer than 3 to 6 weeks. No prolonged adaptive program specifically exists for CIDs. Similarly, the abovementioned energy appeal reaction as a consequence of systemic cytokine stimulation has been positively selected for transient nonlife-threatening inflammatory episodes [2, 74]. Furthermore, genes that are associated with CIDs have been positively selected independent of CIDs. The theory of antagonistic pleiotropy - formulated by Williams in the 1950s - similarly applies to CIDs [2, 75]. This theory suggests that genes associated with CIDs have been positively selected to improve survival at younger ages and to stimulate reproduction independent of CIDs. Recent delineation shows that several CID risk genes have a pleiotropic meaning outside CIDs at younger ages . Organisms evolved under conditions that favored the development of complex mechanisms for obtaining food and for storage and allocation of energy-rich fuels. Energy regulation and cellular bioenergetics take the highest position in the hierarchy of homeostatic control. The main supporters of energy-rich fuel storage in liver, muscle, and adipose tissue are insulin, insulin-like growth factor 1, androgens/estrogens, and the parasympathetic nervous system. We can call them storing factors. In contrast, provision of energy-rich fuels to the entire body in the form of glucose, protein, and fatty acids is mainly supported by mediator substances of the sympathetic nervous system, the hypothalamic-pituitary-hormonal axes (cortisol and growth hormone), and the pancreas (glucagon). We can call them provision factors. Table 3 describes particular aspects of the neuroendocrine immune response linking it to the energy appeal reaction. Data taken from [2, 90]. HDL, high-density lipoprotein. aHypovitaminosis D and others, deficiency in zinc, iron, copper, magnesium, and similar. The energy appeal reaction is not an unspecific fight-or-flight response in the sense of Hans Selye, but an adaptive program. If the adaptive program is used too long, real problems can appear that are a consequence of worn-out regulation. That exhausted regulation really exists is substantiated by the fact that patients on ICUs with severe activation of the stress system sometimes suffer from lifelong adrenal insufficiency even after overall recovery . A longstanding reallocation program can thus lead to acute and chronic disease sequelae as mentioned in Table 3. The framework explains that CID sequelae are a consequence of a continuous energy appeal reaction. The systemic response of the body - the energy appeal reaction - is important to support the immune system during short-lived inflammatory episodes, but its continuous use in CIDs is highly unfavorable. Since disease sequelae are a significant part of clinical CID, etiology of disease sequelae is also part of CID etiology. It becomes understandable that long-term changes of the neuroendocrine immune network as a consequence of a chronic energy appeal reaction are also part of etiological considerations. We conclude that among genetic issues, environmental factors (microbes, toxins, drugs, injuries, radiation, cultural background, and geography), exaggerated immune and wound responses, and irrecoverable tissue destruction, changes of the neuroendocrine immune network in the context of a prolonged energy appeal reaction become a fifth factor of CID etiology . Metabolic pathways drive an energy appeal reaction for the immune response on cellular and organism levels. However, if the immune response is not sufficient to resolve inflammation, the metabolic programs can support ongoing chronic inflammation and lead to metabolic disease sequelae. This suggests chronic inflammation to be powered by energy metabolism, indicating that energy metabolism is a promising therapeutic target. CMS and FB mainly contributed to the first part of the manuscript (cellular energy metabolism), and RHS mainly contributed to the second part of the manuscript (energy metabolism in the body and consequence for chronic inflammatory diseases).